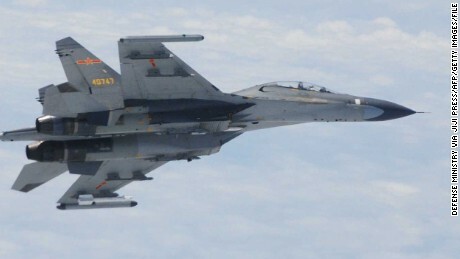 WASHINGTON (CNN) — A United States Air Force reconnaissance plane was barrel-rolled by a Russian jet over the Baltic Sea during a routine flight in international airspace, U.S. European Command said Saturday. The incident on Thursday occurred when a Russian jet “performed erratic and aggressive maneuvers” as it flew within 50 feet of the U.S. aircraft’s wing tip, Danny Hernandez, a spokesman for European Command, said in a response to a question from CNN. The U.S. RC-135 aircraft was “intercepted by a Russian SU-27 in an unsafe and unprofessional manner,” Hernandez said, adding that the U.S. plane never entered Russian territory. “The unsafe and unprofessional actions of a single pilot have the potential to unnecessarily escalated tensions between countries,” said Hernandez, who added that the U.S. is protesting the incident with the Russian government. This encounter comes just days after the U.S. Embassy in Moscow issued formal concerns with the Russian government over an incident in which Russian fighter jets flew very close to the USS Donald Cook in the Baltic Sea this week. One of the Russian jets flew within 30 feet of the Cook’s ship superstructure, according to a U.S. official. In an incident in June, a Russian Su-24 jet flew within 500 meters (1,640 feet) of a U.S. guided-missile destroyer that was sailing in the Black Sea near Crimea. The Russian aerial maneuvers come amid rising tensions on NATO’s eastern flank. In February, the Department of Defense announced it was spending $3.4 billion for the European Reassurance Initiative in an effort to deter Russian aggression against NATO allies following Russia’s 2014 intervention in Ukraine. In recent weeks, the U.S. has deployed additional military assets throughout Europe as part of Operation Atlantic Resolve. Earlier this month, the U.S. Air Force deployed F-15s to Iceland and the Netherlands and F-22s to the United Kingdom. And in February the U.S. announced that it would send six F-15s to Finland for a training exercise and pre-position tanks and artillery in Norway, both countries share a border with Russia.